The chocolate chip cookies from Tulsa’s Altamont Bakery have been voted the best in the Oklahoma city by the Tulsa World newspaper. TULSA, Okla. — Walk into Congregation B’nai Emunah on any Tuesday afternoon and you’ll barely get through the massive, light-filled foyer before it hits you: an aromatic wave of warm oatmeal and raisins, or perhaps a sweet surge of rich, melting chocolate chips. What you’re smelling isn’t catered food for a bar mitzva. Rather it’s one of the most highly regarded bakeries in the region, which is also an innovative social justice project that might just be a model for civic-minded synagogues everywhere. The Altamont Bakery, which operates weekly from the synagogue’s dairy kitchen, is a successful commercial enterprise in which formerly homeless and mentally ill Tulsans work alongside synagogue volunteers. 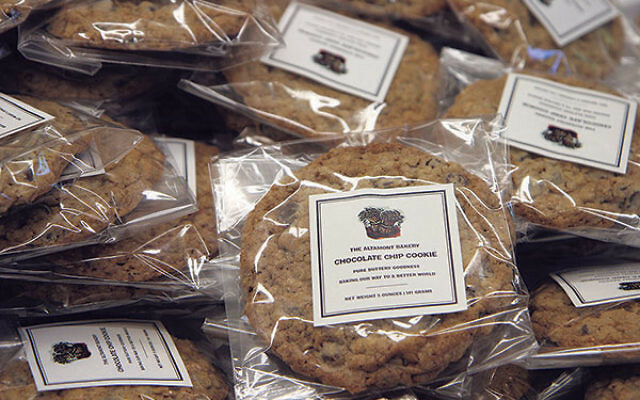 Together they weigh, measure, mix, shape, and bake artisanal cookies that have won the admiration of foodies, selling briskly in coffee shops and cafeterias across Oklahoma and beyond. Yet whether you believe this is the “Greatest Cookie on Planet Earth” (as the label boasts) or merely the best chocolate chip cookie in the city (according to a blind taste test conducted by the Tulsa World newspaper), it’s not the most important thing the Altamont endeavors to create. “We are baking our way to a better world,” said Rabbi Marc Boone Fitzerman, who has served the Conservative congregation since 1985. Fitzerman developed the idea for the bakery five years ago in conjunction with Mental Health Association Oklahoma, which aids those facing mental-health challenges through advocacy, education, research, service, and housing, and the Housing Faith Alliance, which facilitates connections between faith-based institutions and those in recovery from mental illness. The core of the baking staff is made up of individuals served by the Mental Health Association, including some who live at the nearby association-run Altamont Apartments, from which the bakery takes its name. They are paid what Fitzerman calls “a dignified wage”— currently as much as $13.75 per hour. The synagogue volunteers they work beside see this as a meaningful opportunity to effect change in their community while broadening their own horizons. Mental health has long been a focus of the synagogue’s volunteer efforts, Fitzerman said, due in part to the significant number of congregants already working in the field. The rabbi realized he could feed the appetite for social justice work through one of his synagogue’s particular strengths: large-scale baking. “Like many congregations in frontier outposts, we make everything ourselves — rye bread, rugelach, hamantaschen, apple cake, babka — it’s a very full menu of traditional favorites,” he said. On a typical Tuesday, six salaried “Altamonters” and another half-dozen volunteers will produce about 1,200 cookies, which will be bagged, labeled, and delivered by another multi-generational cadre of volunteers that meets Wednesday mornings. Unsold leftovers — a rare phenomenon — might wind up at Shabbat kiddush. 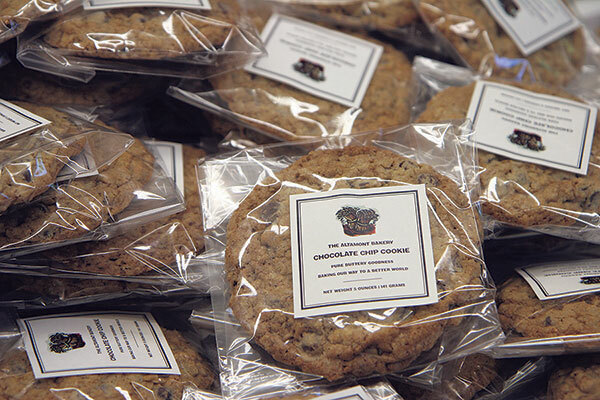 Since its inception in 2011, the bakery has sold more than 150,000 cookies, at $2 each. The profits cover salaries and supplies; the synagogue underwrites the use of the kitchen and Fitzerman raises outside funds to replace equipment and make capital improvements. Anonymous donors furnished two new high-end ovens that can bake up to 220 cookies in 14 minutes. For the second consecutive year, the Altamont has been recognized by Slingshot, a fund that supports and promotes innovative Jewish initiatives across the country. The Altamont Bakery hopes to see its impact grow both in Tulsa, by increasing sales and adding more shifts and workers as the kitchen schedule allows — B’nai Emunah’s 150-student preschool also uses the kitchen — and beyond. Synagogue administrator Betty Lehman said she recently fielded a call from a congregation in Indiana that was interested in launching its own program.